The commitment of traders measured on the S&P 500 using COT data from the SEC is a useful sentiment indicator to warn when big money is leaving the market. The following chart shows a strong cross in Commercial Hedgers declining COT with a strong rise in Small Traders commitment. 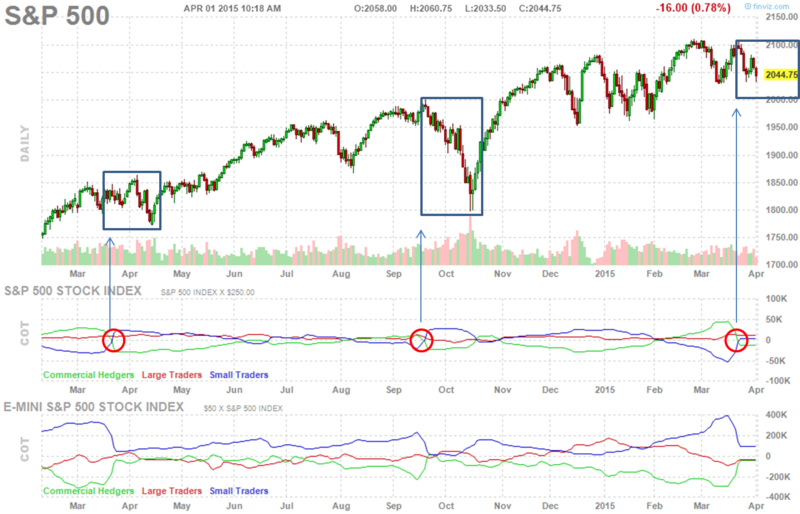 The correlation is very strong with S&P 500 declines when the crossover is highly pronounced. Along with many other cautionary signals, this may be confirmation of a short term dip or trend change in the stock index. While this is a good warning indicator, as long as the S&P 500 does not break trend it will hold as a point to add to positions in the dips. Until the trend is broken as depicted below, the commitment of traders is only an early warning sign that a change in trend may begin. The strength of the downturns vary significantly and only time will show how strong this signal may be. For now the S&P 500 trend remains in a record long and narrow positive trading trend. All the best!